I have worked as a nanny for 19-years and my favorite stroller I have used is the Baby Jogger City Select Stroller . I love that the City Select offers the unique opportunity to customize the stroller into 16 different combinations. I also love the accessories that can be purchased with the stroller, especially the Baby Jogger Car Seat Adaptor. When caring for an infant this is by far the easiest car seat I’ve used. The car seat clicks right into the stroller and can just as easily be put back into the car from the stroller. I found the Baby Jogger City Select Child Tray useful for using on outings as the kids grows older as well. The City Select stroller is so easy to open and close. I can close the stroller with one hand. I have often carried the baby in my left arm and closed the stroller with my right hand and put it into the car trunk — all while holding the baby! The Baby Jogger Company is the original designer and manufacturer of high performance joggers and the all-terrain three-wheel stroller. Baby Jogger’s strollers have been the industry leader since 1984 and are world-renowned for their superior quality, innovative designs, agility, and simple functionality. 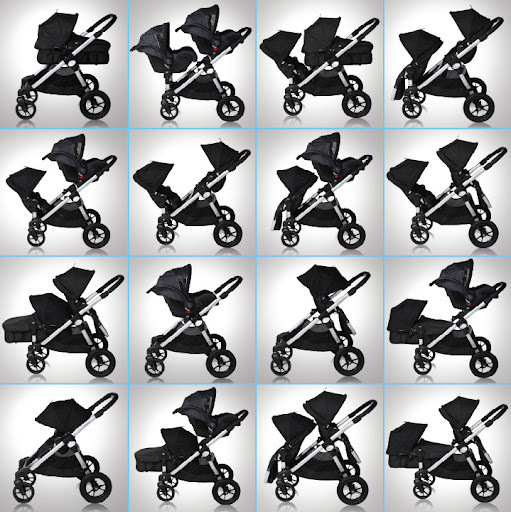 In the past four years Baby Jogger has won over 15 awards for product design, functionality and innovation. Our strollers have been applauded world-wide and the receipt of these awards encourages us to continue to create new, innovative and visually inspiring products for you and your family to enjoy. Thanks for the info about the Baby Jogger double stroller, looks nice! Have you tried it with the other accessories too?